Zoey is a Rat Terrier. 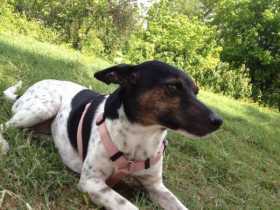 White body with a black and brown face and black markings on her body. She weighs between 10-15 lbs. She has a few teeth missing and has a fatty lump on her side. She is about 13 years old. She was last seen at Beaverwood and Allyson Ct in Spring. She is nervous around people but friendly.